For pruning we need different tools for removing branches and different equipment that helps at pruning. 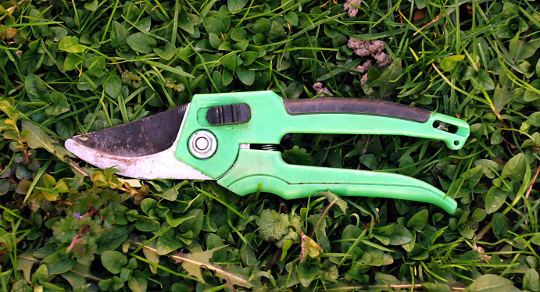 The most important tools are pruning shears or often also called secateurs or hand pruners. Pruning shears are used for cutting thin branches and shoots. 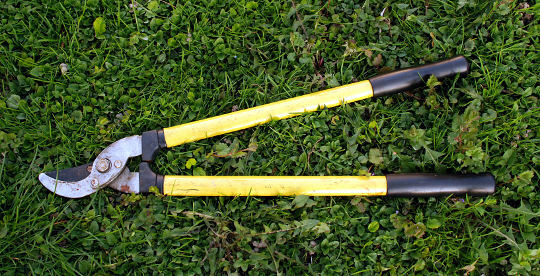 When buying, buy durable and properly designed pruning shears as pruning will be much easier and cuts will be smoother. Good pruning shears are solid, sit in the hand nicely and cut well. The cut is smooth with no torn parts. Mandatory they must have a pin, which keeps them closed. They need regular grind and oiling of joints and spring. Larger branches can be removed using saws for pruning. The saw for pruning has a thick, slightly curved sheet 30 to 50 centimetres long, which is mounted on a wooden or a plastic handle. It can be fixed or retractable. Saw does not need much maintenance. It should be regularly cleaned and the mechanism that allows stacking should be lubricated. Garden knife is useful at pruning. The knife has a slightly curved steel blade length of about 7 centimetres. It is used for smoothing wounds after cutting branches with pruning shears or saw. At taller trees you will need a ladder to reach the highest branches. When thinking about ladder is the most important safety. The ladder should be solid and stable. The most frequently used are folding ladders. These ladders are stable on flat and hard ground, but on slopes or soft ground they become dangerous. The safest ladders have rungs at the bottom, which are driven into the ground to increase stability. Ladders that lean on the trunk are not suitable, because you will not be able to achieve branches on the outer part of the crown.